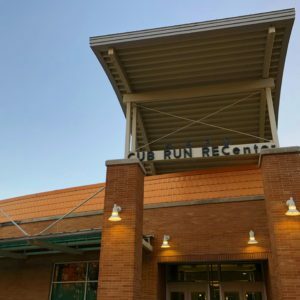 Cub Run RECenter is located in Chantilly, Virginia close to Dulles airport. Our main reason for visiting on a chilly Saturday in the late afternoon was for their indoor water park. Daily passes are available for visits, and the pricing is slightly higher for non-residents of the county. There is individual pricing or one price for a family. We purchased our daily passes at the front desk and received wrist bands. The bands indicated whether each person was 48 inches or taller. That is the height requirement for the two large water slides. The pool deck is down the stairs from the main lobby. There are two family changing areas near the pool deck doors. There are also large locker rooms. To store your items, there are cubbies and hooks on the pool deck, and also lockers inside the locker rooms that lock, as well as a set of lockers outside the pool door. The lockers take quarters to use their locking mechanisms. Cub Run’s pools include a large lap pool and a leisure pool. 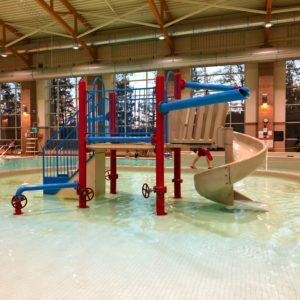 The leisure pool is the main attraction for children, featuring a water play structure with a small slide, lazy river, whirlpool area, and two large water slides. 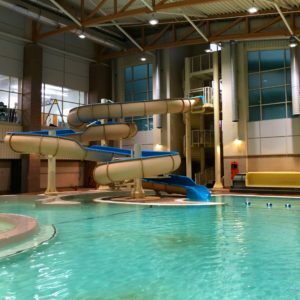 One large water slide is an enclosed tube that exits the building and re-enters just in time for the splash down, which makes the slide mostly invisible inside the building. The second slide is an open slide, which exits into about three feet of water. The water play structure is much like what you’d find in a outdoor park, and I especially liked it because there wasn’t a huge amount of water flying in every direction to get to the slide. The Cub Run leisure pool takes a 10 minute break at the top of every hour. I found it best to prepare the children for this time when they would need to exit the pool. The large slides also close a few minutes before this break. It takes them a few extra minutes after break to reopen. The kids can sit pool side during the break, and while the water and air in the pool was fairly warm, it was best to have a towel waiting on the deck for breaks. The lazy river doesn’t have tubes for floating, but it is still fun to experience the water elements. It does have a nice current to keep you moving. There’s also a round whirlpool area, which is really unique and fun. The current in the whirlpool area pushing you around in a circle. It was a hit with most of the kids visiting that day. Before leaving Cub Run, be sure to check out the nature area in the main lobby, which has some aquatic animals, as well as educational material for children. Bring quarters for the lockers, if you’d like to lock up your valuables. Make sure to try out the whirlpool. It looks just like a circular area of the pool, but it’s actually quite fun. Life jackets are available for children to use on the pool deck, and it may make floating around in the lazy river more enjoyable for small children. Hotels in the area tended to be inexpensive, so pair a visit to this water park with a trip to Washington D.C. and the many museums and attractions for kids.